Catalogue commentaries and introduction by Monica Oppen and Peter Lyssiotis. Essays by Walter Struve (librarian State Library of Victoria), Dr Scott McQuire (Associate Professor and Reader, School of Culture and Communication, University of Melbourne), Humphrey McQueen (freelance historian) and Des Cowley (Rare Printed Collections Manager, State Library of Victoria). Beginning with a preface by Sarah Bodman (Senior Research Fellow for Artists' Books, UWE), this catalogue presents phases of books by artists in 3 sections, Across Two World Wars 1918-1950, Cold War in a Nuclear Era: Alienation and Engagement 1960-1990, Imperialism, Fundamentalism, Democracy, Oil and its Shadow 1990 to the Present, with an additional category Along the Tangent, Books on the Edge for those works, which stand on the periphery of the blurred line defining 'artists books'. The sections begin with essays by Walter Struve, Dr Scott McQuire, Humphrey McQueen and Des Cowley and serve to analyse each period's distinctive characteristics in which these books were created. For the first time in Australia the work of Australian artists and writers working in the field of bookarts have been placed into a context with an international and historical perspective. Each book has been profiled with images and an accompanying commentary. Monica Oppen and Peter Lyssiotis, both practising artists, lend their unique perspective to the social content and the techniques behind the production of these books. Also, five new translations into English, four from the German, including The War by Georg Heym from Umbra Vitae and the complete text of Die Neue Stadt by Josef Luitpold and Otto Schatz and one from the Russian, the poem City from Gorod Stihki by Alexandr Rubakin. All books have been selected from the private collection Bibliotheca Librorum apud Artificem, Sydney Australia and the Rare Books at the Matheson Library, Monash University Melbourne, Australia. The publication of this catalogue is timely as interest in the field of bookarts both locally and internationally continues to grow. 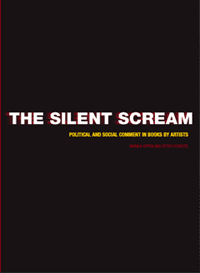 View selected pages from The Silent Scream: Political and Social Comment in Books by Artists online. For a limited time, Australian students / teachers / artists / writers are able to purchase a copy of The Silent Scream at a discounted price. 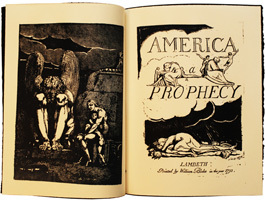 100 copies of the catalogue have been paired with a re-printing of William Blake's illuminated book America: a Prophecy. The new edition is original size and relief printed imitating Blake's own printing method by Plum Letterpress in Sydney in 2011. Printed on Magnani Velata Avorio and hand bound in Moulin de Larroque paper cover with a simple threaded ribbon binding.